Want to REPORT a pothole, graffiti, or broken traffic signal while on the go? Download the Houston 311 app to easily report these issues. The mobile app available in iOS and Android uses GPS to identify your location and also allows you to snap a photo to add to your service request. 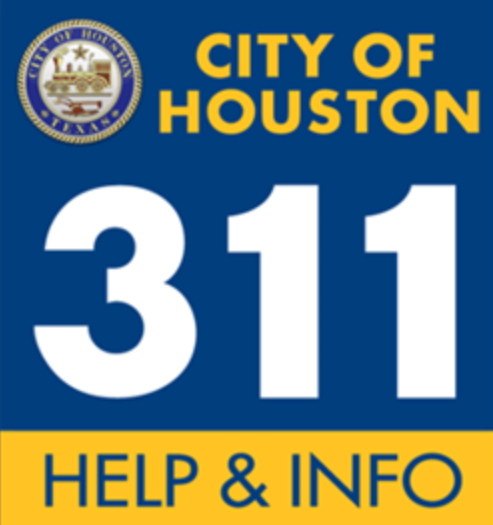 Or call 311 or visit www.houston311.org. PIP meetings provide direct contact with HPD Officers and allow an open exchange regarding neighborhood concerns. Residents get to know our police officers as well as have a chance to learn how HPD works. Learn more here. HPD reports the monthly crime statistics for the area of Houston that includes the Museum Park Neighborhood. Museum Park is mapped to Beat 10H70, Zone 30 by HPD. PIP meetings are held the 3rd Tuesday of every month at the South Central Police Station, 2202 St. Emanuel. Join dedicated members of our Citizen on Patrol (COP) for our neighborhood to promote a friendly and safer neighborhood environment! Learn more. To join the Museum Park Citizens on Patrol team or for questions regarding Safety and Security, please contact Greg Quintero, Lead Coordinator. Community Crime Map compiles crime data and other information from law enforcement agencies. You can see the source of the crime data for any incident by clicking on the incident on the map. The information window lists the "Agency" that provided the information. The Metadata tab also lists the source and links to each source's web page for the incidents that are currently in view. CrimeReports is another site that compiles data from more than 1000 participating agencies to the CrimeReports map. Each agency controls their data flow, including how often they send data, and which incidents are included. Resource for preparedness, response, recover and mitigation from natural and manmade disasters. Program is a localized version of FEMA’s Ready.gov program. Call 2-1-1 to register for Special Needs Registry. Program is free and voluntary for service.